Trash Menagerie, a show in the Art and Nature Center at the Peabody Essex Museum, uses recycled materials to tell the story of our view of objects and our choices about what is disposable. If we saw these objects differently, what would happen? The artists bring this question to life in many different media. On walking into the exhibit, I was confronted by a green-eyed dragon made of bundt cake pans and bicycle brakes. Each section of a pan was part of its body; each brake had become a leg. I can imagine how much welding it took to get that right. Behind the dragon, visitors meet a pair of mechanical insects – built from drafting tools and sewing machine parts – and their sister sculpture, a squid made of small electronics. Ironic uses of plastic are a central theme of the exhibit. A shimmering trout turns out to be a composite of layered plastic. An ethereal crowd of hovering jellyfish and other sea creatures reveal their past lives as plastic soda bottles. A statement by Nnenna Okore, the artist who rolled magazines into a roving band of large spiders, says that seeing poverty in Africa gave her a different perspective on what reused materials are worth. Seeing ways to reuse everyday items we throw away – magazine covers, plastic bottles, newspapers – is a creative act. When we reframe what a plastic bottle means to us, that’s when the sea creatures start emerging. Literally. It’s a new year, there’s snow on the ground… and I’m living in Boston. If I develop any bad driving habits now, I have an excuse. I moved here last month, in a very rapid time frame, and am starting to explore the city. So this is a good time to blog about walking. Back in the 20th century, I lived 10 miles from my high school and had to get there by horse-drawn carriage. Oh, sorry… that’s the wrong story line. Actually, I lived about 13 blocks from my school – which was half a mile from my martial arts class – and walked two to four miles a day. I have a goal of walking more again, now that I’m in a larger city. Boston has at least one organization devoted to walking. Meetup.com lists 67 walking groups in this area. The Museum of Science offers a self-guided walking tour of green buildings. A few months ago, a friend pointed me to Urban Ranger, a site that encourages people to explore – wherever they live – by walking. Prevention.com is one source for local walking routes. Google has also started including walking directions (although they’re still in beta). Overall, the United States isn’t the most friendly place for walking. If you are living near a freeway, and that road is the main way you get to work, you probably aren’t going to walk along the margin of the road to get there – even if you only work a mile away from home. One thing I’ve learned from marketing workshops is that people like their lives to be easy and convenient. We all use shortcuts when we make decisions. If walking becomes an easier choice to make than the alternatives – for example, the default choice for a Google Map – more people will choose it. Although driving can be fun, walking can reduce stress and improve one’s health. Sitting in traffic can have the opposite effect. So, while I love my car, it’s staying in its parking spot now. The direct experience of walking – or biking – is much more interesting than viewing a new city from behind a windshield. Although creative writing isn’t the main focus of this blog, I’ve collected some useful tools that I’d like to share here. They range from practical advice that I completely support to techniques that I will probably never try. Have an idea. Get excited about it. Don’t tell anyone. Find a room with a door that you can close. Start spending uninterrupted blocks of time there, developing the idea. Take a break, if you need to. Network with other writers and editors, if you haven’t already done so, and start exchanging/critiquing/etc.. Keep an eye out for problems that might need repair, but don’t edit so much that you strip the meaning out of your work. Learn basic information about publishing and publicity. Identify your audiences, including potential agents and/or publishers. Send your work out into the world. Don’t be upset when you get rejections in the mail. Ask friends to help you stay motivated. The next steps will depend on what type of project you are doing. But even if you land a great contract with a short deadline, remember to keep repeating step 1 throughout the process. Two tools I have not used are Storymash, a collaborative writing site, and Write or Die, an anti-procrastination tool. Storymash looks like a good way to experiment with ideas and techniques. Write or Die looks too stressful for my taste. It might be helpful for Ph.D. dissertations or other grueling but necessary projects. Edited 4/25/2011: Here’s an update on the plastic that is floating in the Pacific Ocean. Plastic is everywhere – in packaging and in all kinds of products. 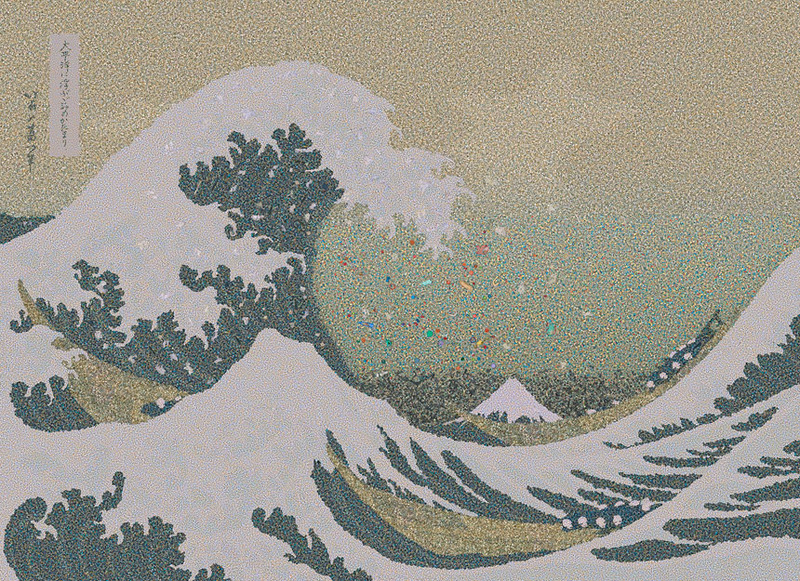 An image of the 2.4 million pieces of plastic that enter the world's oceans every hour. To see close-ups, click the image and view Chris Jordan's most recent exhibit. Once we, ah, contribute this plastic to the oceans, it stays there, unless we harvest it for other uses. There is currently a patch of plastic debris the size of Texas circulating in the Pacific Ocean. I find this disturbing. So does Pete Friedrich, a close relative of mine, who created a comic book about the adventures of these pieces of plastic. Because plastic is everywhere, it becomes invisible to people. Hence the title of this post. Plastic became more visible to me the day I realized how much of our household garbage – and recyclables – consisted of food packaging. Take-out containers were the most obvious problem, but there were plenty of other packages – styrofoam mushroom containers, for example – that are not very useful and are often non-recyclable. Buying salad dressing, sauces and dips rather than making them at home. Sauces and dressings are easy to make at home and aren’t usually available in bulk, even at health food stores. Making sauces at home also means that one can choose the ingredients. It’s a win-win situation. Making sauces can also save money – up to $5 or more for the expensive kinds of peanut sauce. Using canned food. The process of making metal cans – and plastic-lined cans – probably contributes significantly to global warming, especially if the metal is manufactured overseas and shipped to North America. In contrast, buying fruit and vegetables fresh or frozen eliminates a lot of the packaging. Buying bottled shampoo, soap, detergent and household cleaners. Some of these can be made at home using vinegar and other ingredients one can buy in bulk. Many health food stores also give customers discounts for reusing shampoo and soap bottles. Buying any item in a box that one can buy in bulk (or make at home and store). These items can include granola, honey, soy sauce, nut butters, rice, baking mixes, pasta, nuts, beans, couscous, dried fruit, and even chocolate chips. While I feel good about making these changes, I can’t take a big chunk out of that picture of Mt. Fuji on my own. So I hope some of you will give this a try and think about ways you can cut back on your own use of plastic. About a month ago, I read about an innovative architectural education program called Rural Studio that has been featured on public radio and has also become the subject of a book. Students working at Rural Studio are building houses in a very low-income part of western Alabama. These houses were designed to be affordable, with a $20,000 mortgage, for people living on incomes of close to $637 a month. (No, there is not a zero missing in that first number.) The houses look distinctive – these are not cookie-cutter buildings – but they are basic, functional homes built with low-cost materials. Rural Studio has also been expanding its scope to create other community buildings, including an animal shelter and a bird-watching tower. I don’t know how much it would cost to construct these $20,000 houses on a larger scale, but there might be a significant untapped market for houses in that price range in the United States (and probably in other countries too).